An easy to prepare appetizer that is bursting with flavor, this exotic starter is full of Asian-inspired flavors. Prepare the night before and marinade overnight for an easy treat, or whip up a batch to wow last minute guests. In large, shallow bowl combine mustard, soy sauce, honey, lime juice, garlic and ground red pepper. Whisk until blended. Remove and reserve ½ c. of marinade and set aside. Add beef to marinade and toss to coat. Cover and marinate for 20 minutes. Remove beef from marinade. Discard marinade. 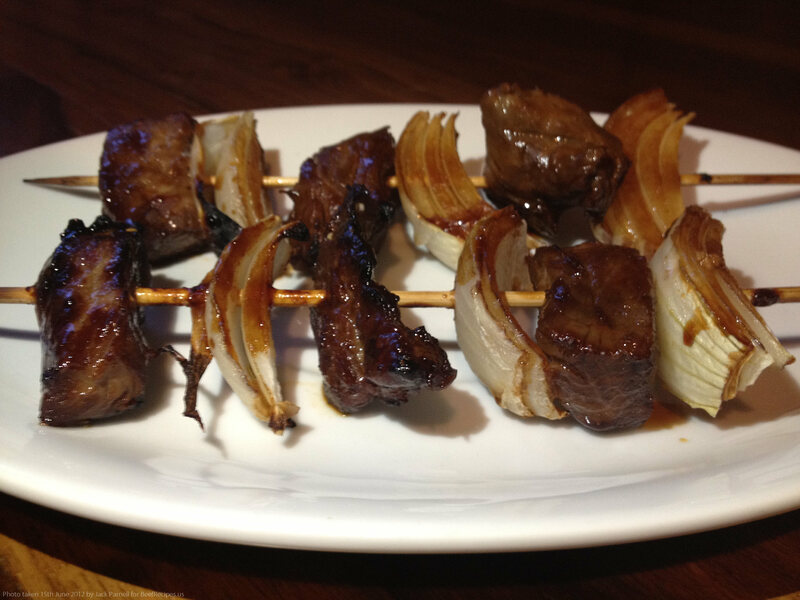 Place beef and onions onto metal skewers, alternating meat and onions. 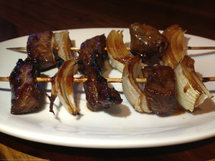 Place skewers on prepared grill. 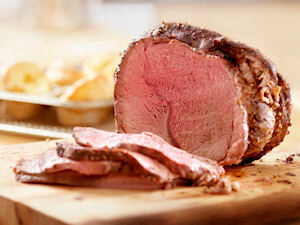 Grill, uncovered for 10-12 minutes, basting frequently with reserved ½ c. marinade until meat is cooked through. Serve immediately. This was really nice, the beef steak soaked up the marinade beautifully. I will make again. Average rating of 5.00 stars based on 1 reviews. Summary: An easy to prepare appetizer that is bursting with flavor, this exotic starter is full of Asian-inspired flavors. Prepare the night before and marinade overnight for an easy treat, or whip up a batch to wow last minute guests.